These baked fries are absolute fry perfection! They’re fool-proof crispy and have the best seasoning on them! Don’t sacrifice taste when opting for a healthier choice. I recently heard that sprinkling fries with vinegar is just a Manitoban thing. I sure hope this isn’t correct because the rest of the world is missing out! But if it is true, then my mission with this post is to share the vinegar love with you all! Now, you can’t really put vinegar on all fries. If you go to McDonald’s or some other chain with stripped down no-skin fries, it doesn’t really work. You need the rustic, skin-on, big bag of fries at the beach type of fries. Douse those babies in vinegar and you’re in heaven! The best part? You’re not adding any extra sugar or sodium (hello ketchup!) when you flavour your fries with vinegar. 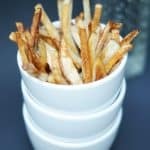 As a bonus, the vinegar may actually help your body to slow down the absorption of the carbs in the fries helping to keep your blood sugars stable. 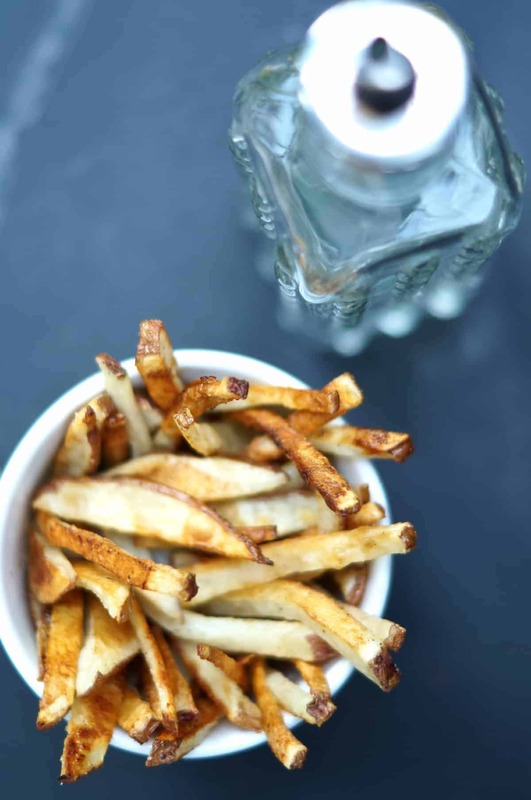 And now, with this recipe for baked fries, you can have that soul-satisfying (satisFRYing?) 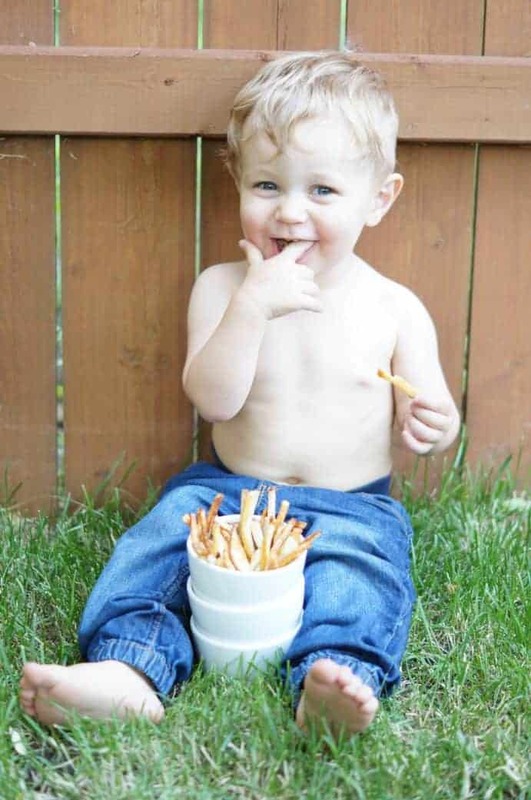 fries experience at home… without all the grease. Yum! Potatoes are a great source of potassium, Vitamin C, and fibre… especially if you eat the skins! Keep those skins on! You’ll save time, effort, and boost the health factor of potatoes! And of course… these baked fries are not deep-fried so they won’t leave you with that too-much-grease-in-the-stomach feeling. Baked not fried, these fries are crispy and soul-satisfying! Slice the potatoes into thin fries. Place in a large bowl. Cover with cold water. Drain the fries in a colander. Line the bowl with a clean tea towel. Dump the fries into the bowl and pat to dry. Try to get as much moisture off the potatoes as possible. Use a second tea towel if necessary. Remove the tea towel from the bowl and add in the olive oil, garlic powder, onion powder, and salt. Stir to combine. Arrange in a single layer on a baking sheet. Bake for 20 minutes. Then stir and bake another 10 minutes or until the fries are a nice golden brown. Sprinkle with vinegar just before eating! Open the oven door a few times while the fries are cooking. This allows the steam to escape and creates a crispier fry. Looks delicious!! Just curious, what is the purpose of the soaking in water for 30 minutes?? There’s some debate as to exactly how/why it works but soaking them in cold water makes them crispier! Soaking them removes excess starch which is what leads to them being crisper. I don’t know the scientific reasoning exactly but I do know that it removes starch. We do this on Friday nights often with fish! I didn’t know the trick about opening the oven door – I’ll try that! I heard that soaking them in water also helps release some of the starch which helps them be crispy – does that make sense to you Jessica? This topic is actually a major head-scratcher! 1) Russets make the best fries. Mostly because they have the lowest moisture content. BUT they also have the highest starch content. 2) A potato is almost entirely starch. 3) Starch often makes foods crispier. My recipe for tofu involves tossing it in corn starch in order to help it crisp up! These are tips I will try. Thank you. We love making homemade oven fries. I grew up in Northern Ireland. Vinegar is very popular on fries, aka “chips”, in Britain. My dad used to always say the vinegar “cut” the fat making it easier to digest, but I have no idea if there is any truth to that. I made it 2x already. It is yummy. I really recommend this recipe to every one. Low calories. So – I don’t like potatoes. I don’t like fries. I just…I don’t, and GAWD to I hate working with them, though I do it all of the time for the family. And then these came about. I might not be a potato convert, but I am a THESE potato convert! The day I ask my family if they want me to make fries again has happened…AGAIN! Wow, what an amazing review! Thanks!